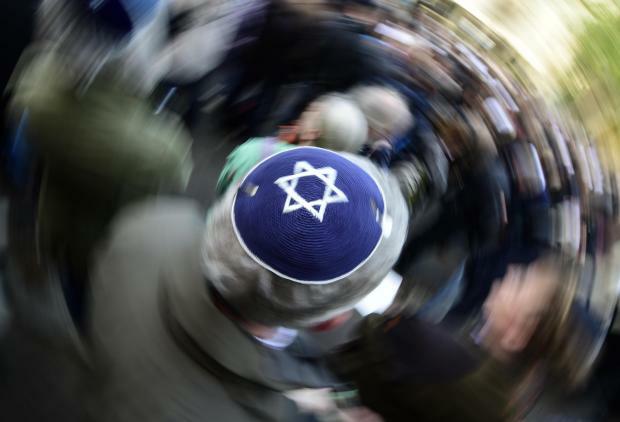 a participant of the "Berlin wears kippa" rally wears a kippa, organised after a spate of shocking anti-Semitic assaults. File photo. Anti-Semitic offences rose almost 10 per cent in Germany last year, and violent attacks were up more than 60 per cent, crime statistics showed Wednesday, sparking alarm in the Jewish community. Police recorded 1,646 offences motivated by hatred against Jews, the highest level in a decade, said a government answer to a request by far-left Die Linke party lawmaker Petra Pau. Among these were 62 violent offences that left 43 people injured, up from 37 physical attacks the previous year, according to the preliminary police data. The president of the Central Council of Jews in Germany, Josef Schuster, said the statistics reflected a "frightening trend" and confirmed what was already a "subjective impression among Jews". "Considering that acts below the threshold for criminal liability are not included, the picture darkens further," he said, urging "a stronger commitment against anti-Semitism by politicians, the police and the judiciary". Chancellor Angela Merkel's spokeswoman Ulrike Demmer stressed that "there is no place for anti-Semitism in Germany" and that Jewish life in Germany must be allowed to "develop freely and safely". Germany, like other western countries, has watched with alarm as anti-Semitic and other racist hate speech and violence have increased in recent years as the political climate has coarsened and grown more polarised. In France, President Emmanuel Macron on Wednesday condemned an "unacceptable increase" in anti-Semitic hate speech, amid outrage over anti-Jewish graffiti and vandalism in and around Paris last weekend. Party co-leader Alexander Gauland has described Nazi Germany's industrial-scale murder of Jews and other minorities as a mere "speck of bird poo in over 1,000 years of successful German history". Another leading AfD politician, the nationalist Bjoern Hoecke, has criticised Berlin's sprawling Holocaust memorial as a "monument of shame". In one prominent case last year, a 19-year-old Syrian man was convicted for assault after lashing out with his belt at an Israeli man wearing a Jewish kippa skullcap while shouting "yahudi", Jew in Arabic. However, most anti-Semitic offences were committed by far-right perpetrators, the Berlin daily Tagesspiegel reported in an article on the new crime statistics.